Bangladesh Navy Join 2018 Officer Cadet Batch Male (2nd Group) on 01 July 2017 has been published. Application Deadline 13 August 2017. Salary and facilities: Bangladesh defense salary and facilities. 1. How to online apply? Alert! when this message send applicant TBNN account must be have minimum balance BDT. 720. After successful payment found a confirmation message with Transaction Id. It's very important to fill-up your online form. 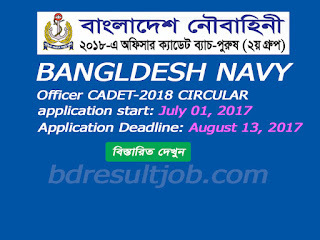 Bangladesh Navy webstie http://www.navy.mil.bd/ click join navy or https://www.joinnavy.mil.bd/ online form fillup. and print online application form in future.